Charlton boss Alan Curbishley has left Scott Parker out of the trip to Everton after reports of a second bid from Chelsea for his services. Curbishley has told Parker to stay away after becoming unsettled by the rumours linking him with a £10m transfer. "I told him not to come in because he's not in the right frame of mind, he's been unsettled by the transfer talk," said Curbishley. "It's not right for him or us while we're preparing for a game, so he's not with us at the moment." Curbishley revealed that Parker is not happy the approach from Chelsea has been rebuffed, but said the decision was down to the club, not the player. "I can't stop clubs bidding for my players - it means we're doing something right - but it doesn't mean we have to accept it. "I think Scott is disappointed by our decision. We know what other clubs can offer our players and that we can't compete with that - but it doesn't mean we've got to jump. "They've made a bid, but it was turned down completely. "We're not naive. There are financial differences, but it doesn't mean we've got to do what Chelsea want to do. "At the moment it is not progressing anywhere. Perhaps it will get messy, I don't know. "I understand everyone's frustration in this, but how about the 24,000 Charlton season ticket holders and the manager who has been here 10 years? "Footballers only think about themselves. But I have to think about the fans and the board and that we're fourth in the table." Chelsea are keen to make Parker a transfer window purchase after suffering a string of injuries in midfield. Frenchman Emmanuel Petit and Argentine Juan Sebastian Veron are out of action for the Blues, while Republic of Ireland winger Damien Duff is making his recovery from a shoulder injury. And owner Roman Abramovich, who spent £111m on players before the end of August, has indicated that he is prepared to pour more money into the club in January. 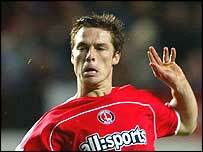 Parker gained valuable first-team experience during a loan spell at Norwich in 2000, before returning to establish himself in the Charlton midfield. He was voted their player of the year last season and also caught the eye of his fellow professionals, gaining a nomination for the PFA young player of the year.